Scientists have created a type of up-and-coming lithium battery that can run on air – rather than pure oxygen – for hundreds of charging cycles. Lithium–air batteries have generated excitement in the battery community as they can, theoretically, hold nine time more energy than an ordinary lithium–ion battery. However, the few lithium–air batteries that can run off air instead of pure oxygen can only be charged tens of times before lithium salts clog their electrodes. Electric vehicles powered by a lithium–air battery would be able to travel far further on a single charge as these batteries can hold more energy than a lithium–ion battery of the same weight. However, lithium–air batteries have yet to run on air for any length of time. The problem is that nitrogen, carbon dioxide and water vapour in air react with ions at the battery’s electrodes, forming deposits that quickly reduce each electrode’s ability to hold charge. Since oxygen is the only component of air needed for productive electrochemical reactions in a lithium–air battery, researchers feed it, rather than air, into a battery. While this eliminates side reactions, it’s not practical for future applications: delivering pure oxygen to a car battery could create safety issues. 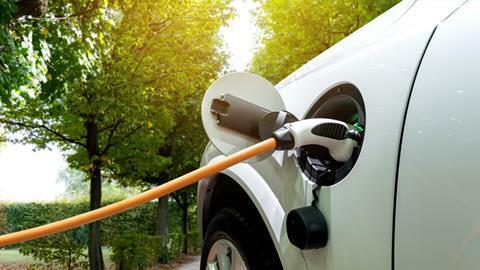 To create a long-lived lithium battery that runs on air, Amin Salehi-Khojin, at the University of Illinois at Chicago, US, and his colleagues designed the electrodes and electrolyte in their battery to minimise problematic side reactions. To make the battery’s anode, the researchers electrochemically deposited lithium carbonate and carbon onto lithium chips. This coating allowed lithium ions to pass through while preventing carbon dioxide, oxygen, nitrogen and water from reaching the reactive lithium at the electrode surface. The researchers minimised side reactions at the cathode by choosing a material and electrolyte that mediated reactions only between lithium and oxygen during charging and discharging. They made the cathode using nanoflakes of molybdenum disulfide, which catalyses the formation of Li2O2 during charging along with its decomposition during discharging. The researchers also filled the battery with an electrolyte containing a lithium salt dissolved in a mixture of dimethyl sulfoxide and an ionic liquid. The structure of Li2O2 formed at the cathode can influence its tendency to collect water and carbon dioxide, which react with lithium ions to form deposits of lithium hydroxide and carbonate that clog reactive sites on the cathode. When the researchers examined a cathode discharging in the mixed electrolyte using transmission electron microscopy, they saw a thin film of Li2O2 on its surface. Computer models suggested that carbon dioxide and water do not stick to this thin film, thus reducing the opportunity to form cathode-clogging salts. A lithium–air battery assembled from the designed electrodes and electrolyte ran for 700 charging cycles in simulated air. A battery created with an uncoated anode and the same cathode and electrolyte failed after 11 charging cycles.